Washington University is highly regarded nationally and internationally for the quality of our teaching, our research, and our service to society. No matter what your interests, you can find a top-notch program in our undergraduate curriculum. Our medium-sized University has approximately 6,000 full-time undergraduates, but you’re also part of a smaller college or school where you’ll receive lots of individual attention. Our residential areas have classrooms and other amenities to support your education. You can choose from nearly 240 student organizations, varsity and intramural sports—and much, much more. Washington University has a beautiful campus surrounded by great neighborhoods. Our students discover that St. Louis is a great place to live and go to school. This genuinely friendly place reflects our Midwestern location. Some say it is our combination of academic excellence and supportive atmosphere that sets us apart. Professor William Buhro, a leading researcher in nanoscience and materials chemistry, teaches undergraduate students. Washington University has a personality, and you feel it everywhere. up from students, professors, advisors, and staff. It’s an academic environment loaded with challenging courses and populated by intellectually curious students and teachers. It’s a flexible, supportive attitude that invites exploration and individuality. And it’s an optimistic outlook that drives innovation and new opportunities. No matter what you study, where you live, or which activities you pursue, these elements pervade your Washington University experience. We have created—and continue to develop—a learning environment characterized by intellectual challenge and academic excellence. We treat your intellectual, personal, and professional growth as our top priorities. We listen and respond to students’ interests and needs. We help you prepare for a career. And we believe that you’ll get where you want to be by becoming an analytical thinker, a problem-solver, and an effective communicator. These principles are at work 24/7 at Washington University. Our commitment begins your first year. A comprehensive resource for all incoming students, the First Year Center, promotes and establishes social connections and academic engagement. We want to give every student opportunities to build and sustain an undergraduate experience of exceptional quality. Each student becomes known to us by name and story, and we commit to helping each one prepare for a life of meaning and purpose. The Activities Fair is held in the Brookings Quadrangle each fall. There’s always something to do at Washington University. What happens when you’re not in class or studying, when you’re between projects, or when you’re just ready for a break? Plenty! Students here are serious about their academic work, but they make time for activities, community service, sports, and social get-togethers. They welcome new people, new experiences, and new ideas. It’s easy to join in. Living in a residential college, you share experiences with other students, making transition to college life smoother. If you’re a freshman from outside of the St. Louis metropolitan area (more than 25 miles away), you are required to live in one of the residence houses your first year. Here you can make friends from around the world, and they’re likely to remain your friends for life. Our residence houses feature recreation/game rooms, lounges, music practice rooms, computing, and laundry facilities. The South 40 residence area is a center of activity with a café, fitness center, technology center, meeting rooms, intramural fields, basketball and sand volleyball courts, game rooms, and photographic dark room. Student-run businesses, including a hair salon and a laundry/dry cleaning business, also make their homes here. Each living/learning community comprises two or three buildings that form a single community. Each has its own identity and flavor, offering many programs and activities. Residential peer mentors: In the residence halls, residential peer mentors offer tutorials in important freshman courses, such as chemistry and calculus, and assist with writing, study skills, and more. Double, triple, or single rooms: Most first-year students start their residential experience in a double room. There are also a limited number of triple and single rooms. All residence houses are co-educational. Resident Advisors (RAs): Each floor of your residence house has one or two Resident Advisors. These specially trained juniors and seniors are available to answer your questions and make referrals to important University services. RAs encourage a sense of community through social and educational floor events, support services, and advising. On-campus: You and a group of friends who share related interests and goals and have a faculty or staff sponsor may apply to live in Village housing on the northwest corner of campus. This living option blends living and learning, action and thought. Many upperclass students find suite-style housing very attractive. In addition, approximately 450 students live on campus in apartments at Millbrook Square and Village East Apartments. Fraternities: A special University housing option exists for members of fraternities—10 fraternity houses are managed collaboratively between fraternity leaders and the University. Off-campus: Beautiful suburban neighborhoods surround our campus, offering a variety of affordable apartments within walking distance. These areas give an even greater degree of independence. Washington University owns many nearby off-campus apartment buildings, which are connected to the University’s computer and telephone systems. Shuttles run through many surrounding neighborhoods from early morning until after midnight. The most visible symbol of St. Louis is its noted Gateway Arch. Designed by the late architect Eero Saarinen and completed in 1965, the Arch symbolizes St. Louis’ role as Gateway to the West. But St. Louis’ location near the center of the country could just as well make it the Gateway to the East, North, or South. Washington University has been an integral part of the St. Louis community since its founding in 1853. The Danforth Campus, surrounded by suburbs and facing Forest Park, is seven miles west of the Mississippi riverfront and the Arch. In between, at the eastern end of the park, are the University’s School of Medicine and the affiliated hospitals and clinics of the Washington University Medical Center. Our students and faculty take advantage of the metropolitan area in many ways—from recreation and cultural offerings and fine dining, to internships and clinical experiences, to volunteering their time to a variety of worthy causes. Washington University has a long and rich tradition of athletic achievement that first started well over 100 years ago. Since the mid-1970’s the Bears have competed as a member of the National Collegiate Athletic Association (NCAA) Division III. Washington U. has been a member of the University Athletic Association (UAA) since the beginning of the 1987-88 season. The day had come to give serious consideration to affiliating Washington University’s intercollegiate program with an athletic conference. As previously advanced in conversations with various representatives of Washington University, there were distinct advantages, both academically and athletically, that would result from conference association. Women’s athletics at Washington University has a long and varied history. Due to a lack of documentation it has been difficult to determine exactly how and when each evolution and change took place. The greatest sources of information have been the school’s yearbook, Hatchet, as well as recently recovered files and departmental correspondence. These have provided the basis for this history. The earliest documented women’s varsity team played in 1909. The yearbook indicated that due to the lack of competitors on the college level this team competed against various high school teams. The women’s athletic program at Washington University has taken many forms since, but has always had a solid place in the lives of its female students. With the construction of Wilson Pool in 1921, swimming became a part of the athletic regimen. Throughout the early part of the century the program continued to expand and diversify. By 1950, women’s athletics had become such a vital part of campus life that 70 percent of the female students were members. For an yet unknown reason, the women’s intercollegiate athletic program was disbanded following the 1955 season and didn’t return for 20 years. In 1975 intercollegiate athletic programming was revived with the re-introduction of swimming, tennis and volleyball varsity teams for women. In 1977 track was added on the varsity level and basketball began in club form. In 1979, women’s varsity athletics were granted access to the “Cage,” the Training Room, and the Field House. By 1980, all coaches for women’s sports were employed full time by Washington University. And yet, competitive athletics and varsity sports do not completely describe the women’s athletic program. For many women on campus, the program represented a strong element in the campus social life. Both the Women’s Athletic Association and its successor, the Women’s Recreational Association, provided a myriad of activities for their members. These events included banquets (1929-1955), intercollegiate playdays, and leadership opportunities. These organizations were the driving force behind most of the women’s activities, including such specialized events as hiking outings (Tramps), college ice skating nights at local rinks (Icicles), and school spirit building (Peppers/Pep Council). For a long time, dance was a central part of the athletic program and many visiting dance companies were invited to campus through the sponsorship of these organizations. Later, the dance department would form and become an independent entity in the University. Throughout its history, the women’s athletic program offered the female student the opportunity to participate on different competitive levels ranging from club to intramural to varsity. Recognition for outstanding performance ranged from the accumulation of points to awards in the form of tokens such as chevrons and bracelets to the highest honors in membership in the various athletic honoraries which have existed since the 1910s (Sigma Lambda Epsilon, “W” Winners, and Phoenix). It was in 1979-80 when several milestones in the women’s program were achieved. Two female full-time coaches were hired to coach in the women’s program; female teams were provided full access to the training room and the equipment room; and basketball and cross country were added as varsity sports. The major addition to the men’s intercollegiate program occurred in the 1981-82 academic year with the reinstatement of men’s basketball. Both men’s and women’s basketball as well as all the teams in the intercollegiate program would benefit from a change in our “independent” status to one involving “conference” membership. Following several years of discussion and planning — eight leading independent research universities announced on June 25, 1986 that they had joined together to compete in varsity sports under a new league called the University Athletic Association. These eight institutions (Carnegie Mellon University, Case Western Reserve University, University of Chicago, Emory Univesity, Johns Hopkins University, New York University, University of Rochester and Washington University), represent some of the leading research institutions in the nation and all have strong undergraduate programs. 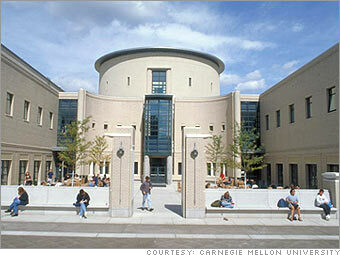 Brandeis University was accepted to the Association in Fall 1987 and has been an active member since. Johns Hopkins left the UAA after the 2000-01 season. Competition between nine members in 15 varsity sports began in fall 1987. The eight current UAA institutions compete in a single round-robin format for football, men’s and women’s soccer, and a double round-robin format men’s and women’s basketball. 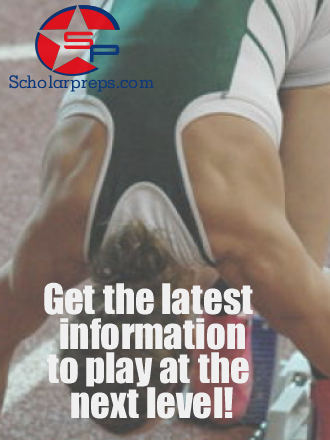 For all other sports, the schools schedule league tournaments or championships at one of the eight UAA campuses. One of the most unusual aspects of the UAA is the geographic location of the eight institutions. Washington University’s farthest opponent, Brandeis University, is situated 1,141 miles from St. Louis, and the closest opponent, University of Chicago, is 289 miles from St. Louis. With these distances, the UAA is the most expansive athletic league in NCAA Division III. The Athletic Complex consists of several facilities: the Field House, Francis Gymnasium, Francis Field, and the Tao Tennis Center. Francis Field and Francis Gymnasium were used for the 1904 Olympics, the third Olympic games of the modern era and the first to be held in the Western Hemisphere. The Field House was the site for presidential debates during the 1992, 2000, and 2004 presidential campaigns. The Athletic Complex was also one of the venues for the 1994 U.S. Olympic Festival. Athletic facilities include a recreational gym with adaptable basketball, tennis, and volleyball courts; an eight-lane, 25-meter swimming pool with diving well; eight handball/racquetball courts; two squash courts; indoor and outdoor tracks; a full weight room and sauna; and the McWilliams Fitness Center. Surrounding historic Francis Field is Bushyhead Track, an eight-lane 400-meter synthetic surface track named for James Butler Bushyhead. Bushyhead Track, site of the 1904 Olympics and the 2004 Olympic Global Torch Relay, is the home of the Washington University men’s and women’s track and field teams. Built in 1902, Bushyhead Track featured a third-of-a-mile track—a track that was used through the early 1980s. While a student at Washington University, Bushyhead (1914-82) was a sprinter on the track team. He graduated in 1938 with a journalism degree and served in the FBI during World War II. After a 40-year career with Moog Industries in St. Louis, Bushyhead retired as President. Washington University’s tradition-rich Francis Field, now 105 years old, is one of St. Louis’ registered historic landmarks. The field’s first use came in 1904 for the Third Olympic Games, the first international games to be held in the Western Hemisphere. Built in 1902, Francis Field’s permanent stands represented one of the first applications of reinforced concrete technology. Francis also featured a third-of-a-mile track—a track that was used through the early 1980s. Following the 1904 Olympics, Francis Field became the home for Bear football contests. During the University’s halcyon days of pigskin—the 1920s, ’30s, and ’40s—the Bears played major college football as a member of the Missouri Valley Conference. There were even floodlights back then, an innovation quite revolutionary at the time. At the height of its day, Francis Field seated close to 20,000 fans with a large section of wooden stands erected on the north side of the field. Francis Field has been the site of several great football contests, including the St. Louis University-Washington U. Turkey Day games, which drew thousands of fans. It also has been the home for the NASL’s St. Louis Stars in the ’70s, the 1986 AAU/USA National Junior Olympic Games, the First and Second National Senior Olympic Games, and the 1985 NCAA Division III National Men’s Soccer Championship. In July 1994, Francis Field served as a centerpiece for the U.S. Olympic Festival as 3,000 athletes were housed on the Danforth Campus for the country’s top amateur sporting event. In 1984, Francis Field underwent its first major facelift in nearly 80 years when the distinctive old wings of the stadium, which jutted out on an angle from either end, were demolished. The seating was reduced to 4,000, and a new press box, a concession stand and ticket window, and a synthetic, eight-lane, 400-meter track were added. In 2003, Francis Field underwent a major renovation. The stadium was resurfaced with new concrete on top of the existing structure, improving its appearance. The stadium was made accessible to the disabled with the addition of two ramps and a new seating area, and the press box was expanded with the roof being repaired. In 2004, FieldTurf was installed as the artificial playing surface for the Bears football and men’s and women’s soccer teams. Kelly Field is the home of the Washington University baseball team. It was the home of the 2006 NCAA Division III Baseball Regionals. Washington University dedicated the newly constructed baseball press box at Kelly Field in memory of Justin “Shef” Sheftel on Saturday, April 1, 2005. Sheftel’s life ended prematurely in late spring 2005 when a car struck him only 30 hours after graduating from Parkland High School in Allentown, Pa. He was just 18 years old. A January Scholar and avid baseball fan, Sheftel was accepted to Washington University in St. Louis and planned to major in business and play baseball for the Bears. The I.E. Millstone Pool, built in 1985, is also located in the Athletic Complex. The eight-lane, 25-meter swimming pool also is equipped with a diving well. Home of the Washington University men’s and women’s swimming and diving team, the I.E. Millstone Pool is also utilized for water aerobics classes, swim lessons and general lap swimming. I.E. Millstone received a B.S. in engineering and architecture in 1927 and an honorary degree in 1994. He became a member of the Washington University Board of Trustees in 1964. He had a successful construction company in St. Louis, and the company built some of the residence halls on the South 40. In 1970, the Millstone Lounge and Plaza were also named in his honor. With a major renovation in the summer of 2006, the Tao Tennis Center can now be considered one of the top college tennis facilities in NCAA Division III. Among the many improvements, the courts were resurfaced with post-tension concrete and were painted to reflect the school colors, red and green. The six courts are red and the outer boundaries are green. In addition, new lights, fences, windscreens, nets, bleachers, and a second storage shed were installed. The Tao Tennis Center served as the host facility for the 2008 NCAA Division III Men’s Tennis Central Regional and the practice facility for the 2007 NCAA Division III Men’s Tennis Championships, hosted by Washington University at the Dwight Davis Tennis Center in Forest Park. Named in honor of William K.Y. Tao, the Tao Tennis Center was originally refurbished in 1985 in conjunction with the renovation of the Athletic Complex. Tao is a 1950 graduate of Washington University, and currently holds the title of affiliate professor in the schools of engineering and architecture. After a major renovation of athletic facilities 22 years ago, the Washington University Field House is considered one of the finest small college facilities in the nation. The facility was completely renovated in 1984 when a new field house was built from the original structure. The Field House can accommodate seating for 3,000 fans and has a floor size of 17,250 square feet. The Field House has a rich and storied past, as it was the site of several NBA games and outstanding Missouri high school state championships, not to mention the numerous Bear games with Illinois, Missouri, Princeton, Harvard, Purdue, Arkansas and others. The Field House hosted the first presidential debate of the 1992 campaign, the third and final debate of the 2000 presidential campaign, and the second debate of the 2004 presidential campaign. The WU Field House is also home to the Teri Clemens Volleyball Invitational, the Lopata Basketball Classic and the McWilliams Classic, two of the most prestigious basketball tournaments in the nation. The Washington University Softball Field is the home of the Washington University softball team. Gateway National Golf Links offers St. Louis golfers the rare opportunity to return to the rich traditions of the game. Rolling links, separated by gentle mounds, meander through lush, green pasturelands. Tall grasses, lakes, wood-tie bunkers, and occasional giant cottonwoods complete the landscape. In view of the Gateway Arch, you will cross occasional stone bridges, glide on raised boardwalks through quiet wetlands, and enjoy play on the only public course bentgrass fairways within hundreds of miles. Gateway National Golf Links was born from the need for a uniquely stunning course, which would cater to individuals who work in or travel to the downtown St. Louis area. Gateway National is located just five minutes from the Arch. Locker rooms with showers and complete dining facilities are available. For more information, please call (800) 482-8856. Take Big Bend North to Highway 64/40 east; Cross the Poplar Street Bridge into Illinois and continue east on Interstate 55/70, follow I-55/70 to Exit #4 (Highway 203), turn left to go North on Highway 203 and go to the second stoplight (Eagle Park Road) and turn left again, then make an immediate left into Gateway National Golf Links. Davidson College is an institution of higher learning established in 1837 by Presbyterians of North Carolina. Since its founding, the ties that bind the college to its Presbyterian heritage, including the historic understanding of Christian faith called The Reformed Tradition, have remained close and strong. The college is committed to continuing this vital relationship. As a college that welcomes students, faculty, and staff from a variety of nationalities, ethnic groups, and traditions, Davidson values diversity, recognizing the dignity and worth of every person. Therefore, Davidson provides a range of opportunities for worship, civil debate, and teaching that enrich mind and spirit. Further, Davidson challenges students to engage in service to prepare themselves for lives of growth and giving. For more than three decades, respect for the Honor Code has permitted Davidson students the unusual freedom of scheduling their own exams and taking them in any classroom of the college’s main academic building—unproctored. A tradition that has endured by allowing change to happen. Freshmen year is a nervous and scary experience for almost every Davidson student. For the incoming class of ‘34 the experience was made even more grueling by a mandatory 1.7 mile race. This race, which has been held every year since, (except during WWII and 1972) has become a trademark of Davidson College and its incoming freshmen; it is the Cake Race (On your mark…get set…go for Cake). Although the race has been an annual event for the past seventy-three years, it has gone through some alterations in order to keep up with the changing face of Davidson College. The race was established by Davidson track Coach Pete Whittle; his goal was to uncover hidden talent in the incoming freshmen class and ask them to come out for the track team (Conn). Fortunately, Coach Whittle knew that forcing the freshmen class to run almost two-miles could not be done without an incentive, and that is where the “cake” in Cake Race comes in. Currently, cakes are the only reward waiting for the winners at the end of the race, but when the tradition first began, items such as “haircuts, picture shows, and various other remunerations offered by the different industrial and economic organizations in Davidson” were given out as well (Morrow Comes in First in Freshmen Cake Race). (Mayer) The cakes rewarded to the winners are donated by people in the Davidson Community, mostly professors or their spouse. The Cake Race is not simply a competition between runners; it is also a contest to see who can bake the best cake. Participation today is now voluntary; whereas, in the beginning “The race was mandatory unless you were in the infirmary or had only one leg” (On your mark…get set…go for Cake). Despite the changes, the race still brings out many participants and spectators every year. On September 24, 1964, the Statement of Purpose drafted by the Committee on the Statement of Purpose was presented to and unanimously approved by the trustees. The final statement was published in the 1964-1965 College Catalogue. Since its inclusion in the college constitution, the Statement of Purpose has undergone both minor and significant alterations. Although minor word alterations took place after its passage in 1964, the Statement of Purpose remained largely intact until revisions passed in 1994 and in 2005. The primary purpose of Davidson College is to assist students in developing humane instincts and disciplined and creative minds for lives of leadership and service. In fulfilling its purpose, Davidson has chosen to be a liberal arts college, to maintain itself as a residential community of scholars, to emphasize the teaching responsibility of all professors, and to ensure the opportunity for personal relationships between students and teachers. Further, Davidson believes it is vital that all students in every class know and study under mature and scholarly teachers who are able and eager to provide for each of them stimulation, instruction, and guidance. The Christian tradition to which Davidson remains committed recognizes God as the source of all truth, and believes that Jesus Christ is the revelation of that God, a God bound by no church or creed. The loyalty of the college thus extends beyond the Christian community to the whole of humanity and necessarily includes openness to and respect for the world’s various religious traditions. Davidson dedicates itself to the quest for truth and encourages teachers and students to explore the whole of reality, whether physical or spiritual, with unlimited employment of their intellectual powers. At Davidson, faith and reason work together in mutual respect and benefit toward growth in learning, understanding, and wisdom. Davidson seeks students of good character and high academic ability, irrespective of economic circumstances, who share its values and show promise for usefulness to society. In the selection of faculty, the college seeks men and women who respect the purpose of the college, who are outstanding intellectually, who have the best training available in their fields of study, and whose interest in students and teaching is unfeigned and profound. The Trustees commit to being faithful stewards of the traditions of the college. They are charged with governing under the Constitution and By-laws and with providing the financial resources necessary for adequate student aid and appropriate facilities and programs, including furnishing the faculty with the time and opportunity for creative scholarship fundamental to the best teaching. As a liberal arts college, Davidson emphasizes those studies, disciplines, and activities that are mentally, spiritually, and physically liberating. Thus, the college concentrates upon the study of history, literature and languages, philosophy and religion, music, drama and the visual arts, the natural and social sciences, and mathematics. The college encourages student engagement with other cultures through domestic and international studies. The college also requires physical education, provides for competitive athletics, and encourages a variety of social, cultural, and service activities. While Davidson prepares many of its students for graduate and professional study, it intends to teach all students to think clearly, to make relevant and valid judgments, to discriminate among values, and to communicate freely with others in the realm of ideas. Davidson holds a priceless heritage bequeathed by those who have dedicated their lives and their possessions for its welfare. To it much has been entrusted, and of it much is required. Davidson’s Residence Life program is dedicated to providing safe, secure and comfortable residential communities that support and enhance student academic performance and social development. Residence Life promotes respect and responsibility among individuals in our community and encourages students to learn from one another to become model citizens. At Davidson, we maintain high expectations for our athletics program. We work hard to attract student-athletes who aspire to compete against a challenging schedule as they contribute to our long tradition of NCAA Division I athletics. Our programs strive to promote personal growth and develop leadership skills in our student-athletes, and to provide a learning opportunity that is as meaningful and memorable as any other part of the Davidson experience. 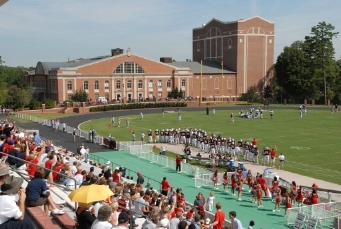 The Baker Sports Complex is the nucleus of Davidson’s athletic program. It is home to events, meetings, training, dining, administrative offices for staff and a state-of-the-art athletic medical facility. The complex is home to Davidson’s men’s and women’s basketball, volleyball, wrestling, men’s and women’s swimming and diving, and men’s and women’s tennis teams. Baker also includes several team locker rooms, two weight rooms, three racquetball courts, one squash court, a dance studio and a modern athletic training room. Located just to the rear of Baker Sports Complex is the entrance to Davidson’s scenic cross country course, which serves as training ground for the Wildcat cross country teams. The complex opened in 1989 and is named for the Baker Family. Thompson S. Baker, Class of 1926, played football at Davidson during the most successful years in Davidson football history and also served as the student body president. The Alumni Stadium is dedicated solely to the varsity soccer programs. The complex features a state-of-the-art field, bleacher seats for 2,000 fans, a brick clubhouse that includes men’s and women’s locker rooms, a scoreboard, lights, and another brick structure with restrooms, concessions, and a ticket booth. The complex was built on the site of the previous soccer field. 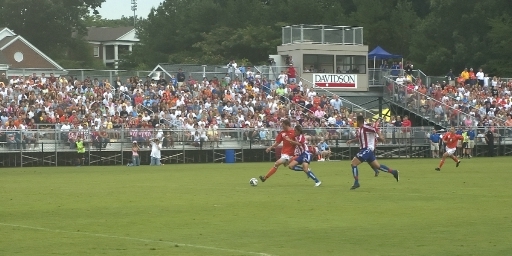 Officially dedicated on November 2, 2004, the new Alumni Stadium was fully functional for the 2005 season and is named in honor of the contributions from Davidson soccer alumni. The Davidson Wildcats dedicated their newly-renovated baseball field, formerly Wildcat Park and now Wilson Field on March 19, 2005, exactly 38 years after the first game was played at that location. The facilities include a baseball clubhouse and batting cages. 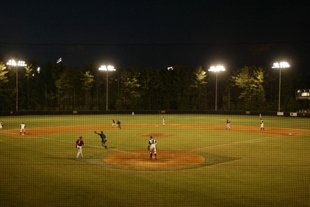 Lights were installed in 2003 with the first night game played in March of 2003. During the 2009 season, the 2009 Team Practice Facility was completed and put into use. The facility, located beside Wilson Field behind the clubhouse, houses the indoor cages that allows the Wildcats the ability to practice year-round. Wilson Field was so named in honor of T. Henry Wilson, Jr., Class of 1951, a former baseball and football player at the college. The facelift to the ball park included a new infield surface, bleachers, press box, concession stand and bathroom, as well as landscaping and fencing around the facility. The project would not have been possible without the generous support of the Wilson family. The first synthetic turf field on campus, the Carol Grotnes Belk Turf field is home to the field hockey teams and features grandstands, a soft synthetic carpet field, and lights for night play. The turf’s three layers-carpet on top of rubber on top of cement-make it durable, weather-resistant, and safe. The facility also provides an alternative practice venue for the women’s lacrosse and football teams on rainy days with lines marked on the surface for all three sports. The field is named in honor of Carol Grotnes Belk from a gift by her husband, Irwin Belk, Class of 1945. The Covington Tennis Court facility is the home of the Wildcat Mens and Women’s Tennis teams, in addition to the indoor courts at the Knobloch Indoor Tennis Center. The courts are named for Howard Wall Convington, Class of 1937. In 2009, the courts were completely renovated with a new playing surface that gives the Wildcats one of the premiere surfaces in the Southern Conference. In its 47 years, the Lake Campus has proven to be a huge success. Students can enjoy 109.6 acres of water front property on beautiful Lake Norman. Located seven miles from campus, the Lake Campus provides Davidson students with the unique opportunity to be involved in a variety of water activities as well as a home for club sailing and crew teams. It also provides for numerous other recreational activities that benefit the school as a whole, such as Odyssey campouts, freshman orientation social, and departmental cookouts. The building was erected in 1968 to the northwest of the current varsity courts (now the clay courts). It is named for Robert Lee Stowe, Jr., Class of 1924, a Belmont textile executive. The clay tennis courts were the original site for varsity tennis but primarily used now for recreational play. The three-hole course situated near the baseball and soccer stadium provides enjoyable practice space for students, faculty and staff. The facilities include well-tended greens, three short holes, sand traps, and a practice putting green. The course is named for Howard Wall Covington, Class of 1937.